Charles Mark Deacon, known as Charlie, was born on 14 September 1898 in Leckhampton, Gloucestershire. He was one of the eight children of gardener George Deacon (bc1860, Queen Camel) and Sophia née Mead (1859, South Cadbury-1921). The children were Agnes (b1880), Emily (b1882), Florence (b1884), Albert (b1888), Frederick George (b1890), William (b1897), Charlie and Edward (b1904). In the 1901 census the family were living in a cottage at Leckhampton, Gloucestershire and by the time of the following 1911 census they had moved to Glanville Wootton, Sherborne, Dorset and 12-year old Charlie was listed as a scholar. Like his father, Charlie worked as a gardener and at the time of his enlistment was working as an under-gardener at Swallowcliffe House, Kingston. At this time the family were living at Grove Cottage, Preston Road, Preston Plucknett. Charlie enlisted at Yeovil, probably during the summer of 1917, joining 2nd Battalion, Princess Charlotte of Wales' (Royal Berkshire Regiment). His Service Number was 38520. The battalion had been fighting on the Western Front since November 1914. Charlie joined his battalion in France during October 1917. At this time the battalion was engaged in day-to-day fighting rather than set battles. In its edition of 7 December 1917 the Western Gazette reported "Mr and Mrs Deacon of Preston Road, have received a letter from their son, Private Charles Mark Deacon of the -- Battalion, Royal Berkshire Regiment, saying that he has been wounded in the leg by a piece of shrapnel during the recent advance in France. Before joining the Colours, Private Deacon was employed by Mr Whitmarsh Mayo of Swallowcliffe, and has been in the Army about 11 months. Mr and Mrs Deacon have two other sons serving in France." The first major action Charlie would have been involved in with his battalion was the Battle of St Quentin (21-23 March 1918). The Battle of St Quentin began the German's Spring Offensive on 21 March 1918. It was launched from the Hindenburg Line, in the vicinity of Saint-Quentin, France. Its goal was to break through the Allie lines and advance in a north-westerly direction to seize the Channel ports, which supplied the British Expeditionary Force (BEF) and to drive the BEF into the sea. Two days later General Ludendorff, the Chief of the German General Staff, changed his plan and pushed for an offensive due west, along the whole of the British front north of the River Somme. This was designed to separate the French and British Armies and crush the British forces by pushing them into the sea. The offensive ended at Villers-Bretonneux, to the east of the Allied communications centre at Amiens, where the Allies managed to halt the German advance; the German Armies had suffered many casualties and were unable to maintain supplies to the advancing troops. Much of the ground fought over was the wilderness left by the Battle of the Somme in 1916. The action was therefore officially named by the British Battles Nomenclature Committee as The First Battles of the Somme, 1918. The battalion was involved in a series of actions, all being part of the German offensive; the Actions at the Somme Crossings (24-25 March 1918), immediately followed by the Battle of Rosières (26-27 March 1918). The battalion then played a part in the extraordinary counter-attack at Villers-Bretonneux on 24-25 April. During this action they faced for the first time the few German tanks that were ever produced. (The Germans also used captured British tanks, mostly from from Cambrai). The battalion was next involved in the Third Battle of the Aisne. On the morning of 27 May 1918, the Germans began a bombardment of the Allied front lines with over 4,000 artillery pieces. The British suffered heavy losses since huddled together, they made easy artillery targets. The bombardment was followed by a poison gas drop. Once the gas had lifted, the main infantry assault by 17 German Sturmtruppen divisions commenced, part of an Army Group nominally commanded by Crown Prince Wilhelm, the eldest son of Kaiser Wilhelm II. Taken completely by surprise and with their defences spread thin, the Allies were unable to stop the attack and the German army advanced through a 40 kilometres (25 mile) gap in the Allied lines. Reaching the Aisne in under six hours, the Germans smashed through eight Allied divisions on a line between Reims and Soissons, pushing the Allies back to the river Vesle and gaining an extra 15 km of territory by nightfall. Victory seemed near for the Germans, who had captured just over 50,000 Allied soldiers and over 800 guns by 30 May 1918. But advancing within 56 kilometres (35 miles) of Paris on 3 June, the German armies were beset by numerous problems, including supply shortages, fatigue, lack of reserves and many casualties. The Battle of the Scarpe was a battle that took place during the Hundred Days Offensive between 26 and 30 August 1918. Heavy rains during the night of 27 August resulted in slippery ground, difficulties in assembling troops and late starts for the assaults. Stiff resistance from the Germans and their heavily defended positions limited gains to around 3 kilometers. 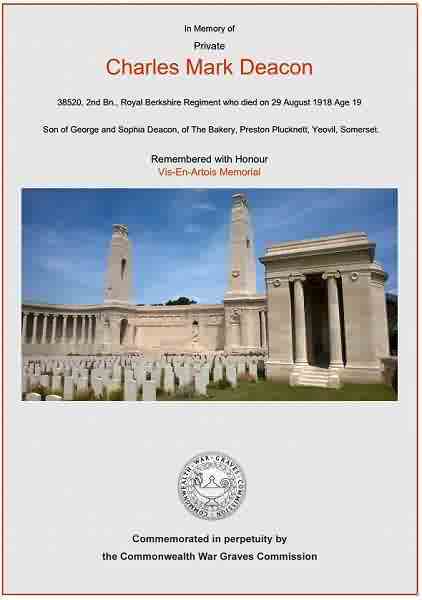 During the afternoon of 29 August 1918 Charles Deacon was killed by a German shell during a barrage. He was just 19 years old. Charles Mark Deacon is remembered on Panel 7 of the Vis-En-Artois Memorial. His name is also recorded on the War Memorial in the Borough and the Preston Plucknett War Memorial. The Commonwealth War Graves Commission certificate in memory of Charles Deacon.